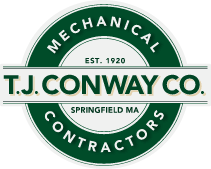 T. J. Conway is a full-service mechanical contractor, with a long history of serving the community. Our recommendations to repair or replace your equipment are based on many years of technical experience. We pride ourselves on our meticulous attention to detail. Our technicians are up-to-date with the latest training developments and the most advanced equipment. T. J. Conway offers a full range of mechanical contracting services to meet the needs of growing communities. Change is constant as businesses, colleges, healthcare facilities, and utilities continually upgrade technology and working space. T. J. Conway brings in the services and features that are right for the project-right for the client and their vision. When it's time for system upgrades, we look at all the possibilities. The solutions we offer can involve obtaining or creating the new system, knowing how to integrate it with existing systems, and how to maintain it. Customized preventative maintenance schedules and programs can be tailored to fit your needs or your budget. Count on 24-hour service that is courteous and professional in a routine maintenance visit or in an emergency situation. Our fleet of services are immediately responsive to emergencies. Our employees treat you with courtesy, patience and a professional response to every call-routine or otherwise. Working to get the most value, highest performance, and longest life from your equipment, T. J. Conway Company is a partner you can rely on for our dedication to excellence. Heating, Air Conditioning, Ventilation; installation and service for gas/oil burners, electric heat, alternative energy sources; warm air, circulating hot water, steam, radiant heat, hydro-air, exhaust fans, make up air, heat exchangers. Package Rooftop Installation; installation, service, warm air with air conditioning.